1-The First Time an Oriundi represented Italy was on January 18, 1920, when Ermano Aebi represented Italy in a Friendly vs. France (9 to 4 win). Aebi’s father was Swiss though he was born in Italy. He also scored three goals in this match, therefore he is the first Oriundi to score for Italy as well. 2- The First Time that a pair of brothers appeared and won in the World Cup was in 1954 with West Germany’s Walter brothers (Fritz and Ottmar). The second pair of brothers were England’s Charlton brothers (Jackie and Bobby) in 1966. 3- The First Time a player scored a hat trick in an official International match was on March 2, 1878, when Scotland’s John Mc Dougall scored three goals vs. England in a 7 to 2 win. 4- The First Time a substitute ever scored a hat trick was on June 15, 1982, during the World Cup Finals when Hungary’s Laszlo Kiss scored three goals in eight minutes vs. El Salvador in their record 10 to 1 victory. 5- The First Time the England National team Manager appointed had also been capped previously was in 1962 when Alf ramsey was appointed as England’s first sole selector. He officially took charge in 1963. Gérard Buscher was a striker who started out at OGC Nice. He exploded on the scene during the 1984/85 season, after joining Brest Armorique from Nantes. During this season, he was one of top goalscorers in the League. He did receive a few call ups, but his actual debut for the French national team was in a friendly vs. Switzerland on August 19, 1986 (0 to 2 loss). He started the match but was substituted by Bruno Bellone in the 68th minute. The following year, after transferring to ambitious Matra Racing Paris, he earned his second and final cap in a friendly vs. West Germany on August 12, 1987 (1 to 2 loss). In this match he replaced Jean-Pierre Papin in the 55th minute. 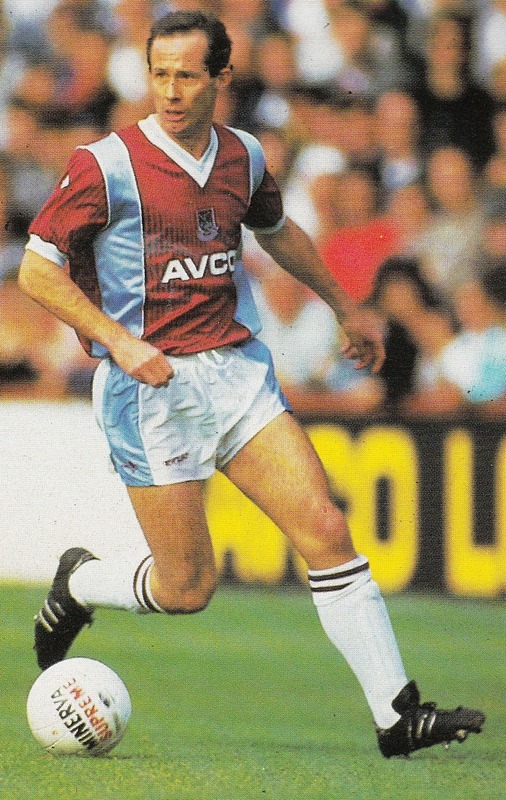 Ear Barrett was a defender who made his name with Manager Joe Royle at Oldham Athletic. He earned his first cap in England’s Tour of Oceania in the summer of 1991 in a match on June 3, 1991 vs. New Zealand (1 to 0 win). After being overlooked for two years he earned a recall as an Aston Villa player by taking part in another summer tour. This time in 1993 in United States for the US Cup. He played on June 13, 1993 vs. Brazil (1 to 1 tie) and on June 19th vs. Germany (1 to 2 loss). Alessandro Melli was part of the exciting Parma squad that had earned promotion to Serie A in 1990. In his first few seasons, many predicted a bright future for him with the Azzurri. It came as no surprise when Arrigo Sacchi selected him for Italy’s World Cup qualifier vs. Malta on March 24, 1993 ( 6 to 1 win). He earned his second and final cap a few weeks later on April 14, 1993 in another World Cup qualifier vs. Estonia (2 to 0 win). The following season he fell out of favor as a starter at Parma after the arrival of Gianfranco Zola. He never recaptured his old form and as a result did not earn any more caps. Sebastiano Losada was a Real Madrid youth product who was on the fringes of the first team, but never really established himself there despite a successful loan spell with RCD Espanol (1987/88). After leaving Real Madrid, he had two unsuccessful spells for Atletico Madrid and Sevilla. He joined Celta Vigo in 1993 and earned his only cap in a friendly vs. Uruguay on January 18, 1995, when he replaced Juan Antonio Pizzi at halftime. That was his one and only cap and he retired at the conclusion of that season, aged just 27. Abel Resino was Atletico Madrid’s goalkeeper during the Jesus Gil era. He had his personal best season during the 1990/91 season when he kept a clean sheet in the League from November to March. He broke the Spanish First Division record as well as Dino Zoff’s record set in 1972-74 for the Italian national team. He earned his only two caps during this season in Luis Suarez last two matches as Spain Manager. In both matches he replaced Andoni Zubizaretta and both matches were losses: March 27, 1991 (came on at haltime, Spain 2-Hungary 4, 3 goals conceded by Abel) and April 17, 1991 (came on 84th minute, Spain 0-Romania 2). Swedish Tomas Brolin breaking his leg when attempting a tackle in Sweden’s UEFA European Championship qualifier vs. Hungary on November 16, 1994 ( 2 to 0 Sweden win). Tomas Brolin had been in excellent form for his Italian Club Parma for many seasons and had just had an excellent World Cup in USA 1994. This injury wrecked his career as he was never the same player afterwards. By the next season he was transferred to Leeds United. After a disappointing spell he was loaned to FC Zurich and ended up at Crystal Palace, but never regaining his old form. Finally, on August 12, 1998, Tomas Brolin announced his retirement at age 28, due to injuries. Republic of Ireland veteran Liam Brady being sent off in the 84th minute of a UEFA European Championship qualifer vs. Bulgaria on October 14, 1987 (2 to 0 Ireland win). Brady was suspended by UEFA for four official matches. On November 17, 1987, Republic of Ireland Manager Jackie Charlton ruled out Liam Brady from the Euro 88 squad unless his 4 match ban was annulled. This effectively ended Liam Brady’s international career and robbed him of a major Finals appearance. Italy’s Giuseppe Signori refusing to play deep left wing in the 1994 World Cup Semifinal match vs. Bulgaria on July 13, 1994 (2 to 1 Italy win). He wanted to play as a forward. He effectively ruled himself out of the Final of the World Cup vs. Brazil on July 17th and also was instrumental in ending his international career. Despite being Italy’s top goalscorer three times in four seasons, Italy Manager Arrigo Sacchi did not select him for the 1996 Euros and according to observers always held this act of defiance against him. Barcelona being paired with Bulgaria’s CSKA Sofia in the semifinals of the Cup Winners Cup in April 1989. Barcelona won both matches (4 to 2) and (2 to 1 away). All three of CSKA’s goals were scored by Hristo Stoichkov who caught the eye of Barcelona Manager Johann Cruyff. He acquired Stoichkov in Fall of 1990 and the rest is Barcelona History. Scotland’s Tommy Gemmell being sent off vs. West Germany in a World Cup Qualifier on October 22, 1969 in Hamburg (3 to 2 West Germany win). Upon his return, his Manager at Celtic Glasgow, Jock Stein dropped him for dishonoring the Celtic and Scotland Jerseys. He was left off of Celtic’s next match in League Cup Final vs. St Johnstone. He was only told prior match by a Celtic employee to sit in the stands. As a result he asked to be transferred and this was the beginning of the end of his Celtic career. Though he stayed another two years before he was actually transferred to Nottingham Forest. 1- Republic of Ireland midfielder Roy Keane nearly joined Blackburn Rovers in the summer of 1993 following Nottingham Forest’s relegation. However, he joined Manchester United once he knew they were interested. 2- Gianluca Vialli joined Juventus in 1992, however he could have joined them sooner in two previous occasions. In the summer of 1984, Cremeonse President Domenico Luzzara had offered him to Juventus for 3 million Lira, but at the time Juventus’ Giampiero Boniperti still had doubts in his ability. Therefore, Vialli joined Sampdoria. In 1987, Juventus came calling with an offer of 10 Million Lira that was refused. 3- In March 1994, AC Milan’s out of favor French striker Jean-Pierre Papin had an offer to join Tottenham Hotspur. He refused preferring to wait until the end of the season and then joined Bayern Munich. 4-In the summer of 1998, Following the World Cup, Manchester United’s Sir Alex Ferguson attempted to sign Patrick Kluivert. However, Kluivert chose to rejoin his former coach Louis Van Gaal at Barcelona instead. 5-Denmark’s Michael Laudrup nearly joined Liverpool in the summer of 1983. Apparently all was signed for a three year contract. However, after some refelction Liverpool came back and offered the same terms for a four year contract. Laudrup refused and instead joined Juventus, who loaned him to Lazio for a couple of seasons. -The World XI selections for the years 1969 and 1971. The best books about the History of the French National Team. This book has a brief biography and profile of French Captain. This small size book has 50 anecdotes and stories around the national team. This book covers every France national Team match with lineups and statistical information until 1991 and players’ information. This book covers every France national Team match with lineups and statistical information until 1999 and players’ information. This big book is perhaps the best book about the History of the French National team with written history plus lineups at the end with many archival photographs and newspaper clippings. This book has a biography of every France National team player. This book is about the History and important events surrounding the French National team. This book talks about the inside story of the French National Team during the period 1993-2002.